Outfit I work with manages forestland in the area, and we brought in a beekeeper w/ hives, and at the end of the process had 300-lb. of wildflower honey. I took some of what I bought for an experiment... Making Mead. 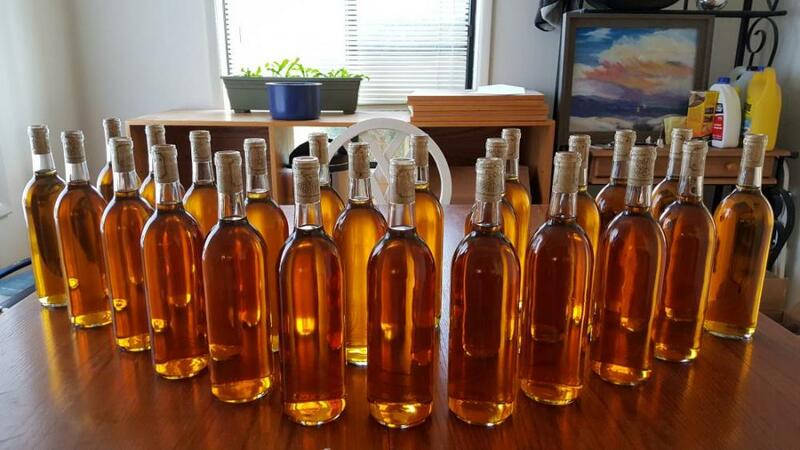 1400's era honey wine. Into it for a month, and expect it will take 3 to 6 months to taste decent. The rest is Christmas gifts, and it is awesome. did you add fruit? What kind of yeast did you pitch? Just normal Fleischmans, not rapid rise. There are probably enough natural yeasts in this honey anyway. I added some oranges for flavor and for the yeast to feed off of, plus some raisins for that same purpose. Once it initially settles out, I will rack into another container and let it sit for a few more months. Have a test batch that I am going to rack tomorrow, clearing up nicely. Good luck bud. I've never done a mead before but certainly have enjoyed some. Hope it turns out great! I've made plenty of mead. Here is some oaked wildflower mead I brewed 3 years ago. It gets A LOT better with age. These bottles have developed into something very special now, with 3 years of age on them. Awesome! Any yeast nutrients? What did you pitch? What was your initial gravity? Good aeration? I was "given" honey just today and went "wing it" mode from memory on research of the topic. I will take hydrometer readings later on but the yeast I pitched (I think it's Canadian) was Red Star brand Premier Blanc. It is percolating already so I believe all is well. All is well... until the rhino's come to visit! Seriously though, good luck with the mead! Sounds like you're prepared to be patient which really pays off. Edited by CaneDog, 06 January 2019 - 09:45 PM. I've got (I think) around 35 gallons of wine going presently. I've had a few mishaps along the way in my years. Hope this isn't one. I am told that mead is amongst, if not the, longest time frame of any wine to produce. Success or fail, I will post it here. Cool! I just figured I'd ask. I've had best results with staggered yeast nutrients, and hella aeration. For me, EC-1118 has been the cleanest and driest, with the highest ABV tolerance, and quickest turn around. that`s a beautiful picture there. My first test batch is now 60+ days, Clear as a bell, and is just going to sit for a couple more months. only around 1.25 liters, but tastes like a chardonnay, a bit on the dry side. Maybe will be better in a few more months. I still get some off-gas activity, so won't bottle until then. That yeast you mention, it is Lavlin or Lalvin brand (don't recollect the name exactly) ? I have used that brand before with positive results. For most wines I make, it tends to be Red Star brand Montrachet yeast. It seems to always be hardy regardless of the fruit I use, with a good ABV tolerance. My first go at Mead, so time will tell. 90+ days in, mellowing nicely on the first batch. The second batch is more sweet, with some orange influence, and is taking longer, but moving along. I plan to bottle up the virgin batch next week. It's only one bottle, but it turned out nicely. I don't have a way to measure AC content, but when I transferred it to the secondary carboy, had a cup and it waxed me pretty good. I'd guess around 15% min. Location:Illinois Growing Zone 5A and the 50th CCW state. Ah, Honey wine. I thought someone as trying to get my attention.